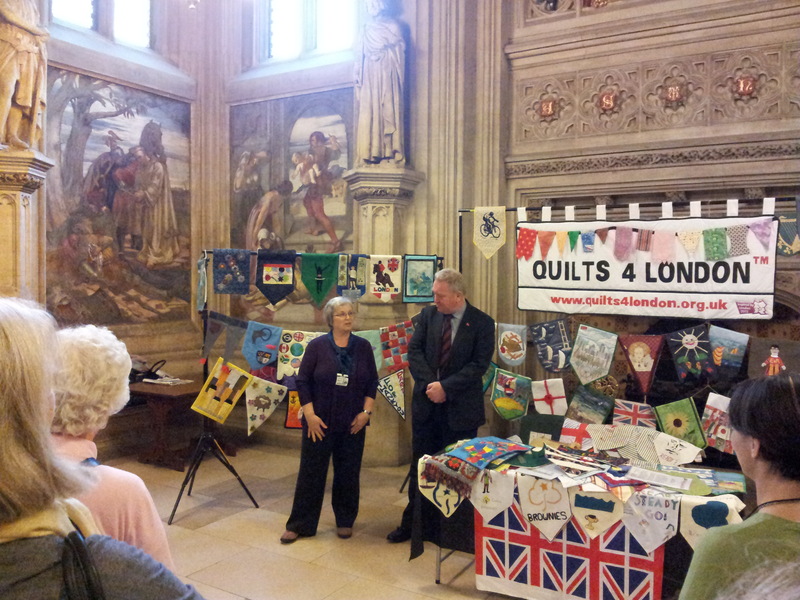 On Wednesday Helen Thomas and I were at the House of Commons for the launch of the Quilts 4 London exhibition in the Upper Waiting Hall. A selection of the pennants that have been made by people all over the world as gifts for the athletes taking part in the London 2012 Olympic and Paralympic Games are being displayed in this prominent position close to the House of Commons committee rooms in an exhibition sponsored by Mike Penning MP. We were joined by some of the people who have made the pennants as well as representatives of the Quilters’ Guild and the London 2012 Inspire Team at LOCOG. Quilts 4 London organiser Irene Heathcote told us that they have now received more than 10,000 pennants and are well on the way to their target of 14,700. As well as the sheer scale of the project, I was struck by some of the individual stories behind the pennants. 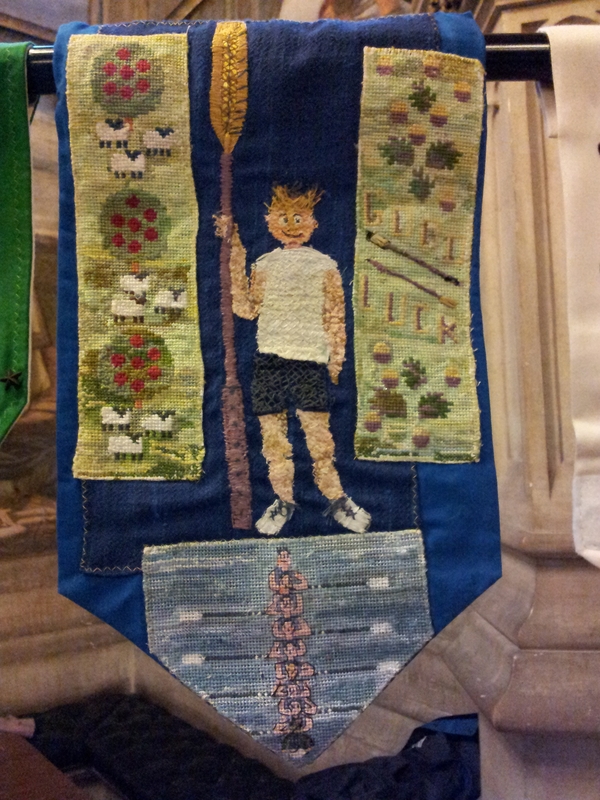 The House of Commons display includes a pennant created by Felicity Gladstone which depicts her uncle, Albert Gladstone, who won a rowing gold medal at the 1908 London Olympics and was the grandson of the Prime Minister, William Gladstone. If you haven’t yet made a pennant yourself there is still time to do so, see: http://www.quilts4london.org.uk. On Tuesday I was in London for a meeting of the England Volunteering Development Council at which we welcomed the new EVDC Chair, Baroness Scott of Needham Market. Jess Steele from Locality gave a presentation on the Government’s Community Organisers scheme – one of the main Big Society initiatives. Locality is recruiting and training 500 paid community organisers over 3 years who will then be charged with finding 4,500 more volunteer community organisers. Jess stressed that the organisers will be facilitators, not leaders. Their job is to listen to people and encourage dialogue: the Government does not intend the organisers to bring any particular message and is not seeking any specific outcomes from the scheme. Jess had just visited New York, Detroit and Chicago to learn from the experience of community organisers in the USA. She explained the plan to create a legacy company that will continue to support the scheme after the end of the Government funding in 2015. Toby Blume from Urban Forum then delivered an entertaining and challenging presentation titled ‘There’s No Going Back to Normal: Normal Was the Problem’. Toby looked at the reality of The Big Society, localism, public sector reform, open government and spending cuts. He suggested that there is still a lot of money in this country: the state’s spending levels are still the same as in 2004/5. He talked about new forms of delivery, new ways of working and creative collaboration and gave examples of Urban Forum members engaged on ‘co-production and community resilience’ and ‘community rights made real’. It was an inspiring presentation which left us with the message “the future is ours to shape”. Last Friday and Saturday I was in Edinburgh to attend ‘Going for Gold’ – the third national Voluntary Arts Scotland Conference. It was lovely to return to the Scottish Storytelling Centre on the Royal Mile, where we held our first Scottish conference in 2007. ‘Going for Gold’ was an excellent conference, cleverly constructed by Fiona and her team, with the attention to detail we have come to expect from them. Hannah Garrow from the Scottish Government opened the conference by reading a statement from the Cabinet Secretary for Culture and External Affairs, Fiona Hyslop, which said that “without the voluntary sector much of the local cultural activity that takes place across Scotland would simply not happen”. Andrew Dixon, the Chief Executive of Creative Scotland, thought there were “lots of cultural stories in Scotland that haven’t been told” and said that Creative Scotland was “talking to people about their place in the creative nation”. He spoke about plans for the Year of Creative Scotland 2012 and the Creative Place awards that will celebrate the most creative towns and villages. The quilter, Pat Archibald, gave an incredibly inspiring presentation about her personal creative journey – one of the highlights of the conference for me, the other being Stewart Murdoch, Director Leisure and Communities at Dundee City Council, who spoke about how we measure value and the search for more meaningful measures for what the arts and crafts offer to quality of life. 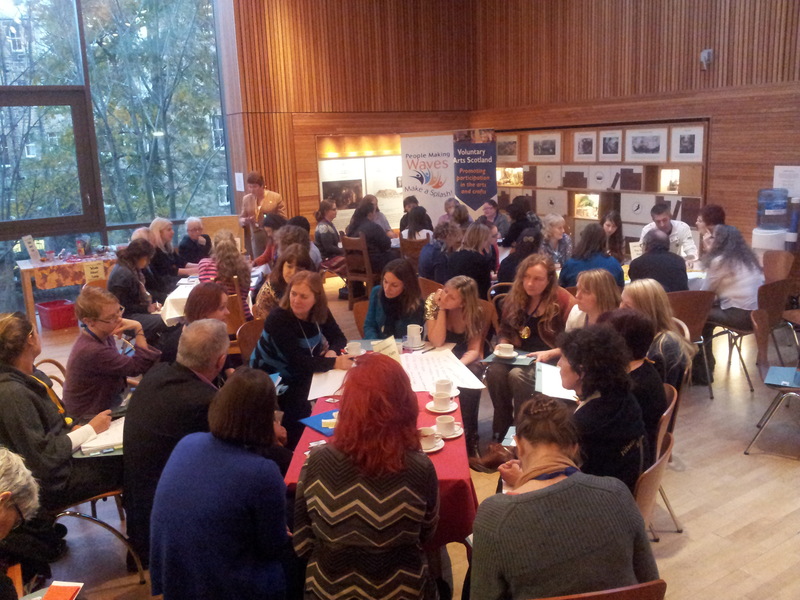 As with previous Voluntary Arts Scotland conferences, the heart of the event was the Café Conversations session – a series of passionate, thoughtful and creative discussions, with delegates moving between tables to listen and contribute. There was a good mix of people including some of our newest Voluntary Arts Ambassadors, local authority arts officers, representatives of umbrella bodies and artists. It was an entertaining, thought-provoking and inspiring two days – well done to everyone involved. On Thursday afternoon I made a first visit to the HM Treasury building on Horse Guards Road. We actually walked right past the door to George Osborne’s office – though I’m not sure whether he was inside! I was there for a meeting of the Office for Civil Society’s European Year of Volunteering 2011 working group. As we approach the end of the European Year of Volunteering, we were joined by Gwen Wolf from the Department for Work and Pensions who is working on the preparations for the UK involvement in the European Year of Active Aging 2012. Gwen updated us on the Government’s plans for 2012 and we discussed possible links between the two years. We also heard from Roisin Murphy from KPMG about their EYV11 work to promote and develop Employer Supported Volunteering and the prospect of developing long-term sustainable partnerships between the voluntary and private sectors. 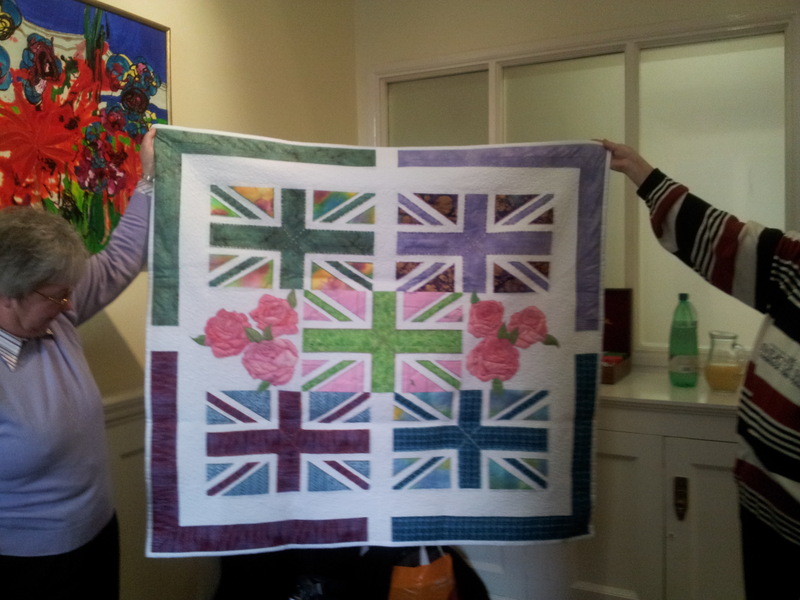 On Thursday Helen Thomas and I were in London for a meeting with Marilyn Lovett (in her capacity as President of the Quilters Guild of the British Isles), and the organisers of the London 2012 Cultural Olympiad quilting projects, ‘A Gift of Quilts’ and ‘Quilts 4 London’. Jenny Rundle and Sharon Garrick from ‘A Gift of Quilts’ (www.agiftofquilts.co.uk) told us that they have now passed the deadline for the submission of quilts to be presented as gifts to each team competing in the London 2012 Olympic and Paralympic Games. 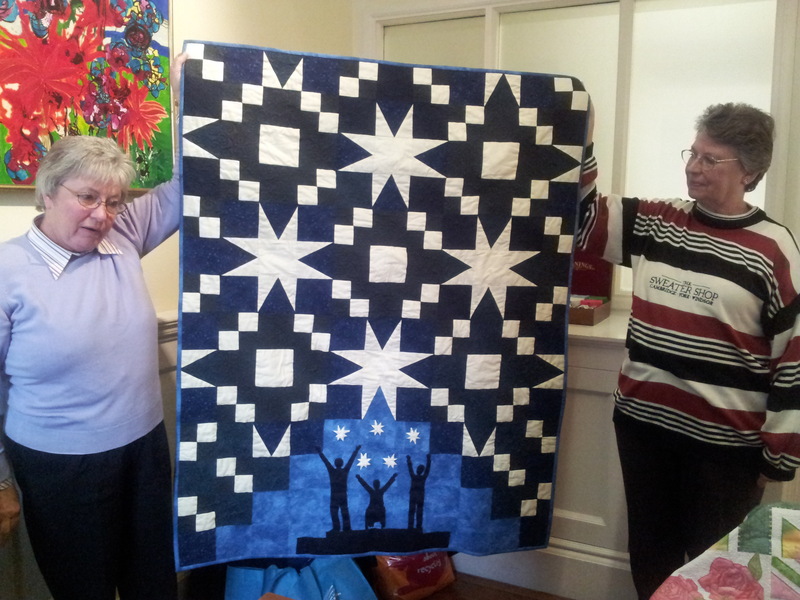 The project has reached its target of more than 400 quilts and has involved more than 10,000 people. All the quilts have been photographed and the book of photographs went to the publisher this week and will be published to coincide with an exhibition of all 400 quilts at Olympia in London from 15 – 18 March 2012. Sharon mentioned some of the messages that had accompanied the quilts including one that said “I am an old woman and I won’t be able to get to London for the Olympic Games but if my quilt goes to London then I’m taking part in the Olympics.” Irene Heathcote and Angela Sullivan from ‘Quilts 4 London’ (www.quilts4london.org.uk) said that in August they had passed the halfway mark towards their target of creating 14,000 pennants as gifts for each athlete competing in the Olympic and Paralympic Games and they have now amassed more than 8,000 pennants. Many of the pennants will be on display at exhibitions in Macclesfield, York, Newbury, Luton and Bath early next year, as well as at the Olympia exhibition in London in March. Thousands of people across the country (and some from further afield) have taken part in the project, encompassing an age range from 2 years old to 97 years old. Both projects are truly amazing and have succeeded in involving masses of people across the UK in the Cultural Olympiad. At Thursday’s meeting we discussed the handover of the quilts and pennants to the visiting Olympic and Paralympic teams and athletes next summer. We are keen to ensure both that the gifts reach their intended recipients and that the handover achieves the best possible publicity for the projects. On Thursday I was at the National Council for Voluntary Organisations for a meeting of the NCVO Members’ Assembly. The prospect of a full day meeting focussing almost entirely on the review of charity law didn’t seem like the most enticing prospect but it was a surprisingly interesting and enjoyable event. UK charity legislation is to be reviewed from the end of this year. Earlier this week, NCVO President Lord Hodgson was invited to lead the Government review. To feed into this process NCVO is launching an enquiry and member consultation on rethinking charity law and regulation. On Thursday we heard from Jane Hobson, Head of Policy at the Charity Commission, and from Lord Hodgson, and spent most of the day discussing what the sector would hope to get from the Government review. There was a lot of discussion about very small charities that fall below the threshold requiring them to register with the Charity Commission, whether the threshold should be changed or whether there should be other ways of recognising such small charities. Jane Hobson emphasised that the Charity Commission regulates all charities, not just registered charities. Other topics I found particularly interesting were the question of whether charities should be allowed to pay Trustees, the role of the Charity Commission in providing guidance and/or advice to charities and the question of defining public benefit. The NCVO AGM was held after lunch. NCVO Chair, Martyn Lewis, paid tribute to his predecessor, Sir Graham Melmoth. Martyn reflected on the year 2010-11 which had seen a small drop in NCVO’s income but an increase in its membership (from 7,719 to 8,375 member organisations). Major cuts in funding did not come into effect until the 2011-12 financial year but their impact was felt at the end of March when one third of NCVO staff were made redundant. Nevertheless NCVO is pursuing a bold and positive strategy, having secured planning permission and a bank loan to build a fourth floor on its headquarters which will become a charity hub and a home to more voluntary organisations. NCVO Chief Executive, Sir Stuart Etherington, said that there is a real anxiety about what is happening in world markets and we are now expecting four or five years of low growth levels. He said the voluntary sector is starting to shrink, with staffing levels across the sector showing a net loss for the first time – and this might just be the beginning. Although the sector did see the financial crisis coming and planned for it, the speed and impact of the financial hurricane proved impossible for deal with. Stuart did, however, find reasons to be optimistic, including the fact that Government remains supportive of the sector. It’s a tough time and it’s a time when Boards become much more important. Stuart also said he feels that NCVO is needed much more now than it was five years ago.